If you follow me on Facebook, you've probably already seen this picture. Of all the pictures I took, the selfie ended up being the best. And I took, like, a "gajillion". This sweater was finished months ago and is the one that I designed for the Shirley Paden design-along from the I Love Shirley Paden group on Ravelry that I posted about here. We were given a group of stitches that Mrs. Paden used in many of her own designs, and told to develop original designs using one of them. She held our hands through the entire design process, which involved sketching our ideas, swatching, and knitting. The things we learned were based on her book "Knitwear Design Workshop". The book is now on sale in the Interweave store for $3.99. You should do yourself a favor and purchase a copy. My favorite parts of the sweater are the cables (of course) and the neckline. At first, I had a difficult time getting the neck to stand the way I wanted. But then I decided that the fabric at the neckline had to be firmer, either through knitting the neck with smaller needles or by doubling the fabric. I decided that I wanted to double the fabric, so I knit the neckline twice the height that I wanted it to be, folded the extra fabric to the inside, then sewed it down. Worked like a charm. 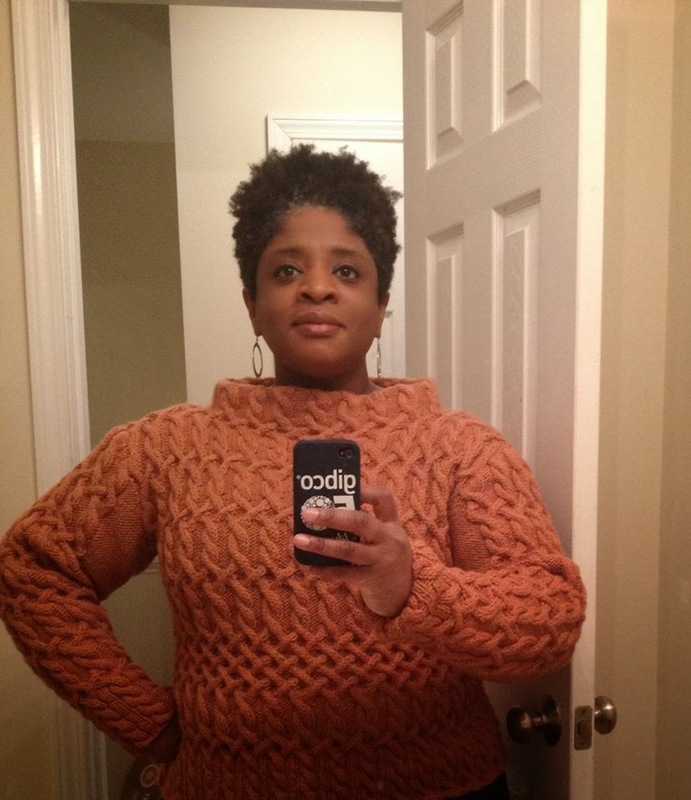 That sweater is awesome and I LOVE that neckline! This sweater is amazing I say in awe of You !!! Luv it !